My "action" today was attending a book launch of a friend and neighbour, Hans Tammemagi. His new book, Air: Our Planet's Ailing Atmosphere, is all about the most important thing on Earth — what we breathe! "Tammemagi's fascinating exploration of air illustrates that it is far from being an empty void; rather, it is a vast ocean of gases that are layered, constantly mixing, generating weather, and providing the basis of life itself. 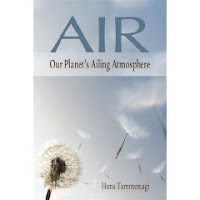 While illustrating the beauty and mystery of air, Tammemagi also examines its declining quality in chapters that discuss smog over cities (and elsewhere), acid rain, the depletion of stratospheric ozone layer, and, of course, global warming. As a scientist, writer, and activist, Tammemagi explains the key issues associated with air in a clear, lucid, and compelling style. Air is a vital piece of reading on an issue of rapidly growing urgency." After reading aloud from a few chapters — and admitting that he's feeling rather pessimistic these days — Hans led a discussion amongst the attendees (from our small rural community) that showed how many people still have a lot to learn about the urgency of the climate crisis. So, fellow educators, how do we reach our neighbours, friends, colleagues, acquaintances? How do we make this most obfuscated of environmental and scientific issues ever, crystal clear for people like several of those I sat with today? First, let's make sure we understand it ourselves — and find a way to stay up to date with the ever-growing body of research. Try Climate Emergency News, for starters. Next, let's work together to find that happy medium — somewhere between holding it up to their faces and rubbing their noses in it — that helps people hear, see and learn things they just don't want to open up to. I guess I'm suggesting that we don't just need compassion for people who are already being impacted by climate change. We also need compassion (no time left for patience) for those who are so far removed from what's happening in other parts of the world that they cannot feel compassion for the most climate-vulnerable people themselves. Sometimes this isn't easy. So let's go easy on ourselves if we muck it up somehow. We're still learning too! Let me know if you need some morale-boosting or inspiration.